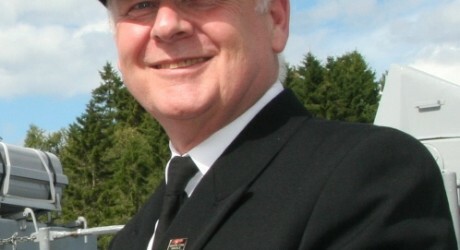 CAPTAIN Nick Bates has commanded some of the largest ships in the world including the QM2, with 4,000 passenger and crew aboard and a Masters ticket which allowed him to sail into any port and cross any ocean. Adding to his list of achievements, he is now pleased to announce he has achieved his licence to skipper a canal barge with a capacity of 12 on the Union Canal. Since his retirement in 2010 after 45 years at sea, Captain Bates has turned his attention to philanthropy and public speaking. In order to comply with today’s health and safety standards he has completed his training and test to navigate the specially adapted barge along the Union Canal for the one of the charities he works with closely, the Seagull Trust, who offer free canal cruises to people with special needs and their carers. It is a great cause which Captain Bates enjoys devoting time to help, and it’s a great opportunity to be back on the water. With his varied career at sea and similarly diverse retirement activities, Nick’s venture into after dinner speaking provides him many opportunities to recount his many interesting experiences. His book, ‘With a pinch of salt’, is a delightful combination of the origin, of many every day expressions that have stemmed from our nautical heritage and a few tales from his 45 years at sea. More of Nick’s endeavours include his passion for art, and he is a founding member of the Inverleith Art Group with the money from any sales of his watercolours going to his favoured charities. He has also created a group and discussion forum for dog owners called The Dog Watch, with a magazine and newsletter. MEDIA RELEASE posted by Tartan Silk PR. You too can post media releases (aka press releases) on allmediascotland.com. For more information, email here.